3-Story-Deep Vaults Found Under Market Parking Site. (1951, Jan 4). The Baltimore Sun. Giordano. J.M. (2015, Apr 21). The Catacombs Beneath Lexington Market. Baltimore City Paper. Kelly, J. (1992, Jul 22). Federal Hill: cobblestones, a view, and now tunnels Quarries are found beneath famed park. The Baltimore Sun. Kelly, J. (2009, Jan 18). In City’s Overlooked Underground, 29th Street Tunnel Gets New Task. Baltimore Sun. Lexington Market History. (2017). 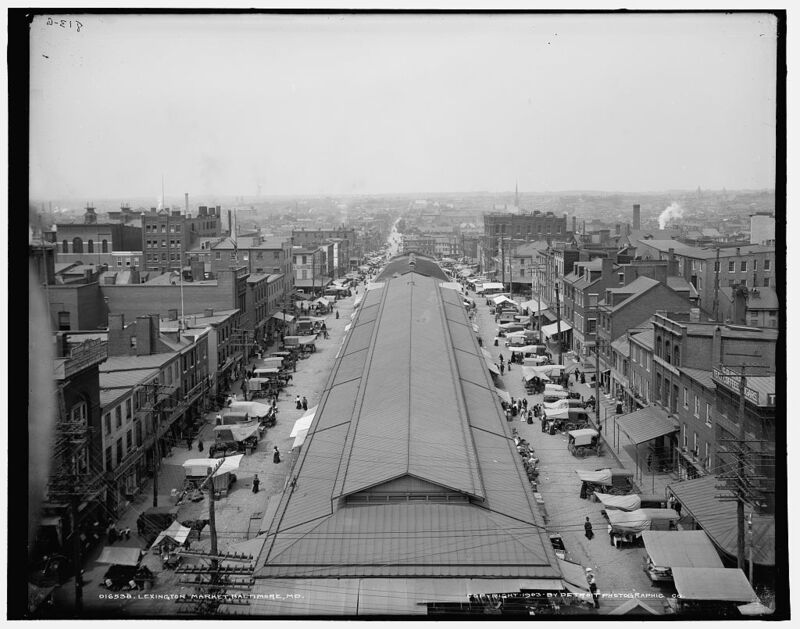 Lexington Market and Baltimore Public Markets, Lexington Market. Planning Assistants. (1976). Lexington Market. MHT B-2275. Commission for Historical and Architectural Preservation. Maryland Historical Trust. Shoken. F. (1999, Jun 25). Market Center Historic District. MHT B-1262. Betty Bird & Associates. Maryland Historical Trust. Tkacik, C. (2016, Nov 16). 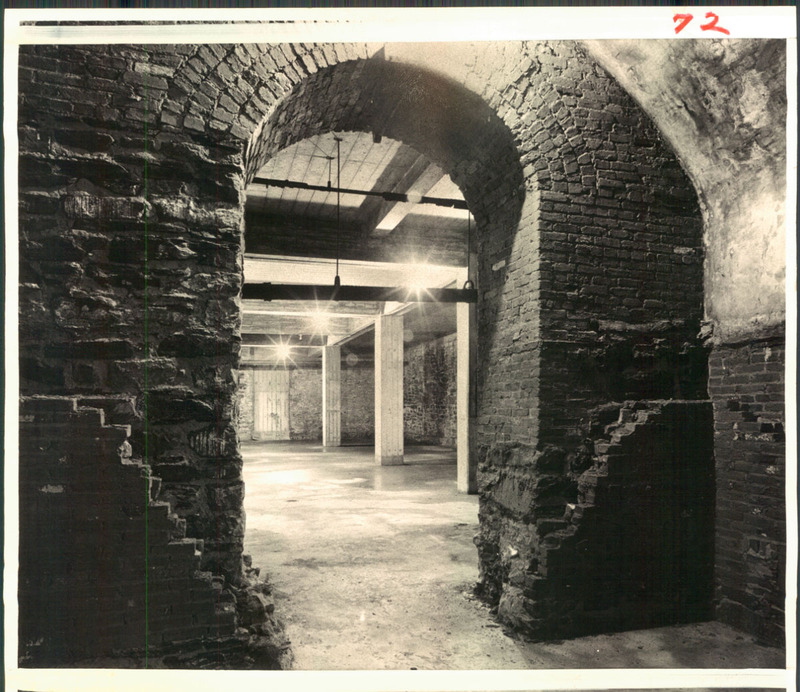 Baltimore Heritage offers tour of Lexington Market’s underground vaults. Baltimore Sun. Tkacik, C. (2016, Jul 21). Exploring Lexington Market’s underground vaults. Baltimore Sun. Woods, B. (2015, Apr 21). The Battles of Lexington: City Paper goes deep inside and under Baltimore’s oldest market. Baltimore City Paper. Albertype Co. (1900). 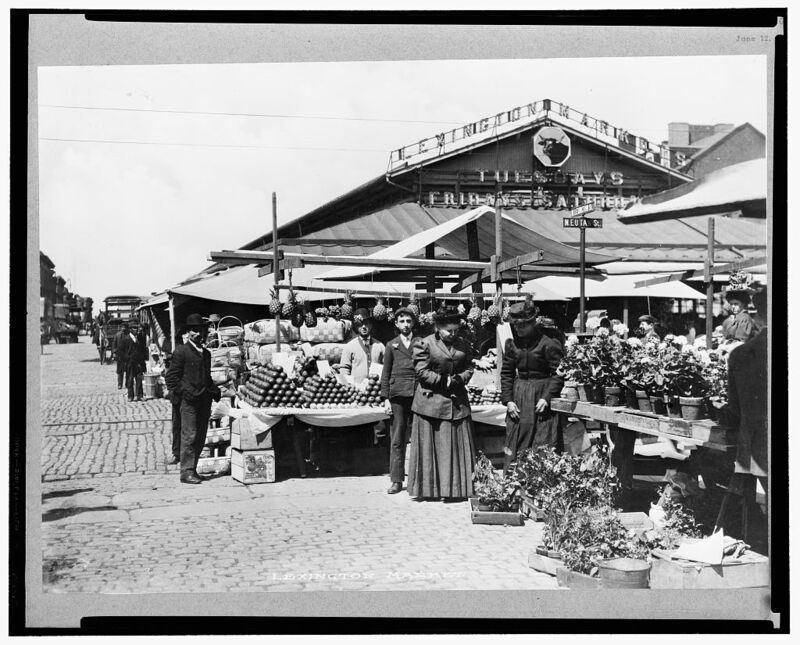 People near tables where fruit and flowers are being sold at the Lexington market in Baltimore, Maryland. 1850-1900. Prints and Photographs Division, Library of Congress. Lexington Market, Baltimore, MD. (1909, Feb 28). Postcard Published by I. & M. Ottenheimer. Prints and Photographs Division. Library of Congress. Detroit Publishing Co. (1903). Lexington Market, Baltimore, Maryland. Prints and Photographs Division, Library of Congress. Lexington Market. Shows outdoor vendors and patrons. Signs in background: Dimling’s Groceteria and Great China Tea Company. (c 1920-1930). Gelatin silver print. Julius Anderson Photograph Collection, Baltimore City Life Museum Collection, Special Collections Department, Maryland Historical Society. Lexington Market, Baltimore, Maryland. (1921). Baltimore City Life Museum Collection, Maryland Historical Society. 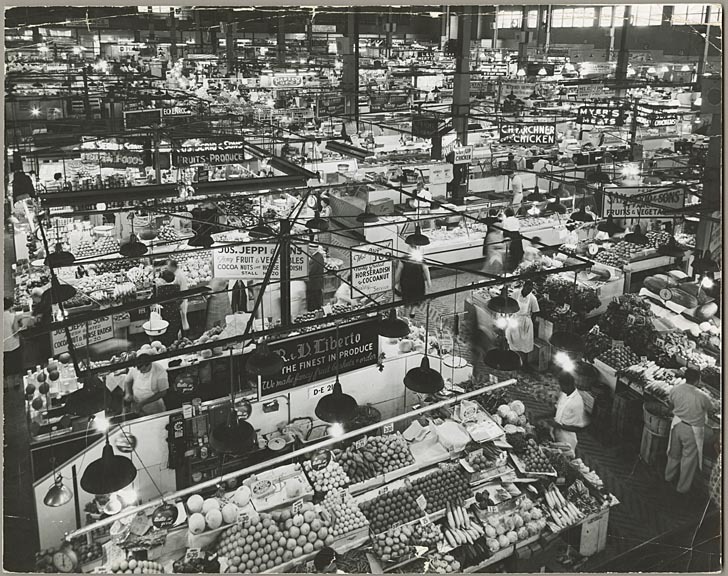 Interior view of Lexington Market, 400 West Lexington Street, Baltimore. (1966). Unidentified photographer. Baltimore City Life Museum Collection, Maryland Historical Society. Swasman, P. (1976). Lexington Market. Neg #16. In Lexington Market MHT B-2275 (1976). Commission for Historical and Architectural Preservation. Maryland Historical Trust. Lexington Market. (1953). Sanborn Baltimore 1914-1953 Vol 1A, 1914, Sheet 20A. In Lexington Market MHT B-2275 (1976). Commission for Historical and Architectural Preservation. Maryland Historical Trust. Baltimore Sun. Reprinted with permission from The Baltimore Sun. All rights reserved.